Good hygiene is essential for every gym and fitness centre. With increased competition across the industry, the reputation of your brand is at risk if your gym isn't up to standard in terms of appearance, equipment and cleanliness. Discover how you can improve gym cleanliness and hygiene with this handy best practice guide. 2Do you follow best practice guidelines for cleaning? 3Do your staff do absolutely everything to provide a clean, healthy gym environment? 4Do you empower both staff and customers to actively participate in maintaining hygienic practices? 5Do you partner with a reliable service provider for regular maintenance and supplies? If you're unsure of any of these questions, then this guide is for you. High filtration vacuum systems to remove dirt and germs from floors. Good ventilation throughout the gym - this could include ventilation systems and passive ventilation like adjustable windows and roller doors. Quality drainage in shower and bathroom areas to reduce dampness. While it's not always possible to change or renovate your space, there are things you can do right now to ensure best hygiene practices. Is gym equipment really at risk of germs? Free weights have 362 times more bacteria than the average toilet seat. Treadmills have 74 times more bacteria than a tap in a public bathroom. An average exercise bike contains 39 times more bacteria that a food court tray. Given the amount of people that use gym equipment on a daily basis, it should come as no surprise that there is so much bacteria on these items. Still, you don't need a survey to know your clients expect the their workouts to be in clean, hygienic environments. Your customers can help keep gyms hygienic and clean. Post these handy tips around the premise, and ensure your customers understand your gym's code of conduct and are active in trying to keep the gym clean. After all, it's in their best interests to have a safe, hygienic, positive gym experience. It's amazing how many gym goers still don't bring their own towel to their sessions. A towel keeps sweat off key components of the equipment. Your customers should bring a clean towel to every session as a condition of entry. In order to maintain high levels of hygiene throughout the gym, members should wipe down any and all equipment they use, as soon as they have completed their exercise. The onus should always be on the person who just used it, not the person about to use it. Thongs or waterproof sandals should be worn while using the showers to prevent the spread of bacteria. Wet environments can be a breeding ground for microbes so it's essential every gym member wears appropriate footwear in the shower. Don't bring germs into the gym when you have the flu or another contagious illness. Overall, it's better for your health to stay in bed and get some rest. That's the message you should convey to your customers. If your customer is sick for an extended period, consider offering them a discount on membership so they don't feel obligated to come. 1 An hourly spot check for rubbish, discarded bottles and forgotten towels. 2 Regular spot cleaning of equipment as you go. 3 Daily vacuuming of floors, wipe down and disinfect equipment, cleaning showers, toilets and changing rooms. 4 Weekly checks for damage and equipment wear and tear, mopping and scrubbing floors. Deep clean carpets. It's necessary not only to create a good schedule, but to stick to it as well. Leading by example will promote staff to engage more thoroughly in cleaning assignments. When it comes to hygiene, education is key. More than just neatness, you want to reinforce ultra cleanliness in your gym. When inducting new staff, pay particular attention to hygiene 'hot spots'. Places like door handles, hand weights, and floor mats are all breeding grounds for bacteria. Conduct regular best practice cleaning exercises with existing team members as well. Scrubbers: Our scrubbers come in a variety of sizes for multiple applications, from floor cleaning to gym equipment maintenance. Steam cleaners: Ideal for deep cleaning your gym floors, steam cleaners come in both high and low pressure models to suit your flooring. Sweepers: Depending on the size of your gym, a push sweeper will usually do the trick. For larger sites and open areas, ride on sweepers get the job done quickly. Carpet extraction: Spot cleaning and professional extraction machines keep carpets in your gym looking fresh and clean. Polishers and rotaries: Ideal for a variety of surfaces, our polishers include single disk, triple disk and propane machines. Pressure washers: Busy gyms with hard wearing flooring can use pressure washers, particularly in outdoor areas. Vacuums: High quality vacuums with dust control and filtration. Cleaning agents: High grade cleaning agents that are environmentally friendly. What cleaning chemicals are appropriate for cleaning gyms? Hospital grade disinfectant cleaner with 10% bleach is suitable for gym use, provided it's not corrosive on metal gym components or used too close to electronic equipment. Use cleaning agents appropriate to your floor space (i.e. 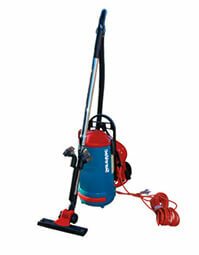 hardwood cleaners, concrete and tile scrubbers) and purchase in bulk for more cost effective approach to cleaning. Ensure these products are environmentally friendly. If you're unsure, check with Alphaclean. We provide a number of sustainable cleaning chemicals suitable for gym use. Not all cleaning equipment is created equal. 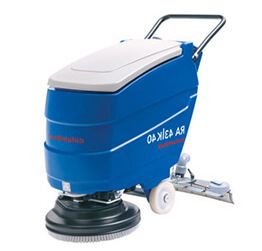 Alphaclean stocks only the highest quality cleaning equipment available. Check out our top picks for gym cleaning below. A multipurpose floor cleaner, the Truvox Multiwash uses the latest in cleaning technology to deliver a stellar floor cleaning experience. 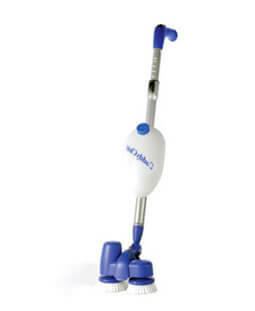 Prefered by commercial cleaning companies, the Truvox washes, mops and scrubs your floor, collecting water as it goes. A complete cleaning device in a small package, the CaddyClean Classic is a nifty handheld device that's excellent for cleaning smaller spaces. It's simple to use, highly effective, and can easily transform into the CaddyClean Handy with a quick action release. The Surevac SV2 'Aussie Backpack' has been in action since 1985. Surevac have improved the product over the years to ensure it remains one of Australia's most popular cleaning devices. Despite its robust performance and feature set, it weighs only 4.1kgs. Suits right and left handed use with easy clip rotation system. Removable lambswool sleeves for harness comfort. Commercial grade steam cleaning with 5 liter continuous water feeding, the Matrix S04 is perfect for steam cleaning large gym facilities. 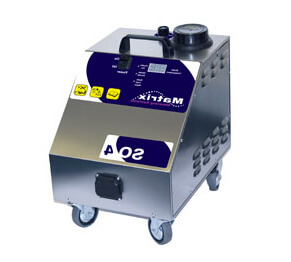 Equipped with a range of brushes and accessories, this commercial steam cleaning system is compact and lightweight, with a durable stainless steel frame and boiler to ensure great return on investment. 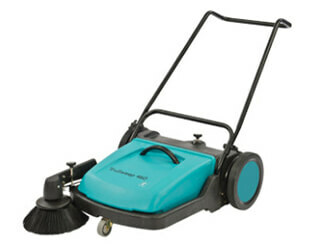 Powerful industrial sweeper with push action control and a massive 40 litre hopper capacity. The TruSweep 460's robust construction and high maneuverability make is a great option for medium to large gym facilities. Anti-wrap brush design prevents from wires, string and other long materials from catching on the brushes. 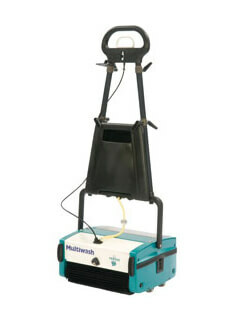 Cable operated multi-application scrubber ideal for deep cleaning on small and medium sized surfaces. Recovery tank is HACCP compliant and can be completely opened for efficient cleaning and maintenance. You want the best gym experience for your customers, and that includes a clean, hygienic environment. But you don't always have time to be an expert in everything. That's why it's essential to partner with proven brands to ensure you're getting the best advice and value for money when cleaning your gym. Talk to Alphaclean today and discover how we can help make your gym the cleanest fitness centre in the neighbourhood.